Meyer Sound LEO is supporting the Danish pop/soul group Lukas Graham on their current European tour. The band is packing large halls and small to mid-sized arenas while thrilling fans with funky danceable tunes - usually abetted by a brass section - and the emotional urgency of Forchammer's introspective songwriting. Delivering that potent mix of intimacy and impact is the responsibility of Frank Grønbæk, the band's FOH engineer since late in 2012. For Grønbæk, the key to crafting a successful set is giving each vocal and instrument its own space and weight in the mix. "One of the things I like about mixing this band is that there are relatively few source signals, so you can build space around the sounds rather than cramping things down because you need to hear a lot of things all at once," said Grønbæk. "There's room in there so you can actually have every instrument fill up space, and that's really nice." 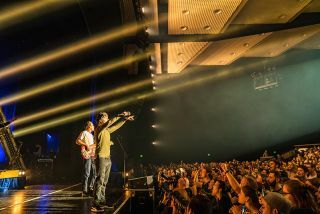 As the foundation of the audio production package accompanying the tour, Grønbæk specified a Meyer Sound LEO Family reinforcement system, supplied by Victory Tour Production of Denmark. "When I first heard the band on a Meyer LEO Family system about three years ago, I realized there is a difference between what you can hear on that system and all others available on the Danish market," he said. "Every detail, in every frequency band, was precise and defined. When you added something like 250 Hertz on EQ, it actually came right out in the mix, instead of being like a smudge. You really could hear, 'Okay, whoa, that's what I'm doing!' And that's super helpful." To accommodate venues of varying shapes and sizes, the tour is carrying a flexible inventory based around 20 LYON-M main line array loudspeakers with four LYON-W wide coverage line array loudspeakers for near field coverage. Bass reinforcement is supplied by a dozen 1100-LFC low-frequency control elements. Sixteen LEOPARD compact line array loudspeakers are available for placement, according to venue requirements, as front fills and outfill arrays, with more help as needed from a pair of UPQ-1P loudspeakers. Everything is tied together and optimized by a Galileo Callisto loudspeaker management system with three Galileo Callisto 616 array processors (including an AES version at FOH) and one Galileo 408 processor. "What I enjoy about mixing on the LEO Family systems is that what I put into the system is exactly what I get back out," continues Grønbæk. "Everything is clear, across the full frequency spectrum, and I appreciate that in acts like Lukas Graham where the vocal is extremely important. That's why whenever we play venues that don't have house systems, I try to get Meyer Sound. It makes a huge difference for me."